Passover Art Activities for toddlers, preschool, and grade school children. * I usually add an explanation of the food found on the seder plate with the project. Take a paper plate. paint it with yellow paint. then glue cotton balls to it. 2. each group constructs a matzoth house using matzoth as the walls and roofs and the peanut butter as the cement. 3. Using the peanut butter, the children add Hershey bar windows and doors. Other candy can be used for additional accessories. *I take photos of the matzoth houses to have a lasting memory before allowing the children to eat them. Mini seder plate uses the cd’s that come in the mail from AOL, etc… Have children glue on or make stickers of the items on a seder plate, add glitter or sequins to jazz it up. Then glue on the underside a little plastic cup where the disk hole is for the stand. Matzah collage: I teach 3 and 4-year-olds and have been doing this for years. I let the children break the matzah and let them glue their broken pieces on a brown piece of construction paper. Lots of very creative pictures emerge from this activity. The children have to tell me what their design is. Chametz Brooms- Take a paper plate and cut it in half. Children then decorate any way you choose ie: crayon, tissue paper, and glue, paint, etc. Then staple a Popsicle stick to the rounded side of the plate (handle for dustpan) Then punch a hole in an edge and tie a piece of yarn through it. At the other end tie and glue a feather (the sweeper) Then let the hunt for chametz begin. paper plate frogs – paint plate green, and red on other side fold in half (red will be inside of mouth) add eyes, feet, whatever…be creative I try to remember to punch a hole in the center of the plate first then, we can hang them from the ceiling and they look like they are jumping all over our classroom. Decorate a kiddush cup for Elijah. Use a plastic wine cup and glue on tissue paper for a stain glass look. Another way to decorate it is to paint with either glitter glue or glitter paint. make a matzah cover. Have parents send in a handkerchief and let the children paint it. Another way to decorate it is to place small pieces of tissue paper all over the cloth and then let the children spray it with water from a spray bottle. After it starts to dry remove the tissue scraps and it leaves a beautiful tie-dye effect. 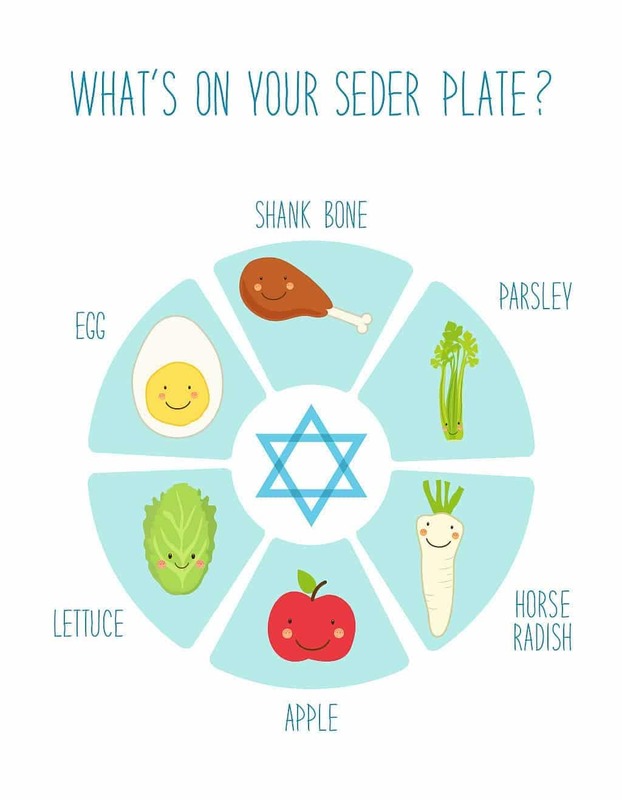 To make a seder plate: Have children draw about 2-inch pictures of an egg, a shank bone, a piece of lettuce, charoset, and bitter herbs. Label each picture for the child. Then glue the pictures to a colored plastic plate. decorate pictures with glitter glue pens. Place a clear plastic plate over the colored and secure with glue around the edges. Draw a large circle. Have class collage the different symbols for the Seder plate using tissue paper, cotton balls for the egg, salt for the salt water, etc. Go to your local supermarket and collect a few flyers containing kosher for Passover foods. Cut the pictures out (i.e. grape juice, matzoh etc.) Cut 2″ circles from colored construction paper and glue them down around the border of the large paper plate. Then glue the food pictures on the circles.